Courtesy of The Paleo Diabetes Diet Solution by Jill Hillhouse and Lisa Cantkier © 2016 www.robertrose.ca Reprinted with publisher permission. Available where books are sold. Image: Tango Photography. Pat chicken dry with paper towels, removing as much moisture as you can. Arrange on the wire rack over the prepared baking sheet, leaving space in between, if possible. Roast in preheated oven for 30 to 35 minutes, flipping them over halfway through, until juices run clear when chicken is pierced. Meanwhile, in a large bowl, combine lemon zest, lemon juice, pepper, and salt. 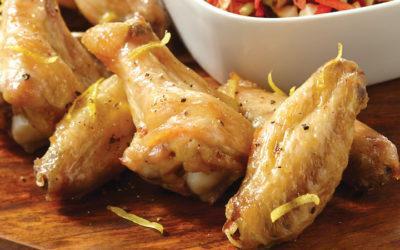 Add wings to the lemon sauce and toss until evenly coated. Serve hot.